In the form of new bull market highs. The sudden death by heart attack of Argentina's ex-President Néstor Kirchner ignited a rally in Argentine stock and bond markets. 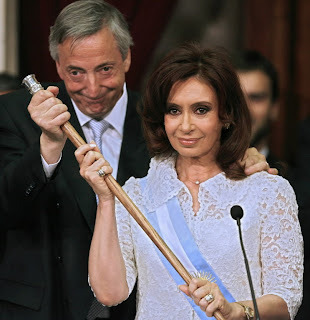 Along with his now-widow, current President Cristina Fernández de Kirchner, the deceased had mapped out a political dynasty marked by heavy state intervention in the economy. His passing during an election season improves the chances of the market-friendlier opposition against Mrs. Kirchner.